It’s Finally Finished! | Just Create! A New Kind Of Stash	Focus! It’s done! It’s done! 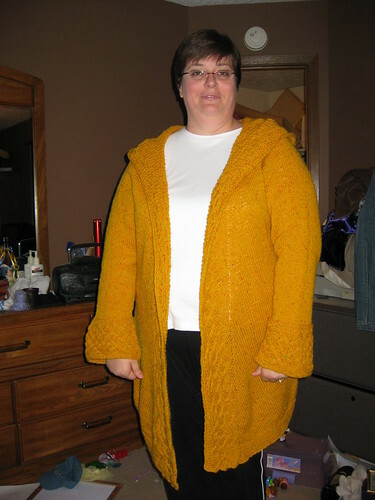 It’s finally done!The Susie Cardigan from More Big Giirl Knits is finally finished and wearable! I was able to cast off Tuesday, I think, and got it washed and blocked Wednesday. I wore it Tuesday unwashed, but now that it is washed it is a bit softer and easier wearing. This is only my second adult-sized garment and the first of this magnitude. This sweater is HUGE! It is long with long sleeves and a huge hood. Plus, I made it in the 2X size! But it is surprisingly lightweight and comfortable. I can wear it on days that are cool instead of a jacket and I won’t worry about getting cold. I really enjoyed knitting this cardigan. It would have been mind-numbing to knit all that stockinette in the body of the sweater had I not had the shaping, bias rows and cables to knit along with it. There was always something different going on so you had to pay attention. In the end, I made a simple chart for myself with each row numbered according to the corresponfing cable row and marked on each one what special thing I needed to do. I was able to cross off rows as I went, so I never worried about losing my place. The cable was fun and interesting and I am much better on cabling now than when I started, although I never did get the hang of cabling without a needle. I definitely think this sweater will see a lot of wear in the future! Needles: Size 6 – beginning on Boye Interchangeable then switched to Knitpicks Options around arm area. Excuse the weird expression! I think DH caught me talking! 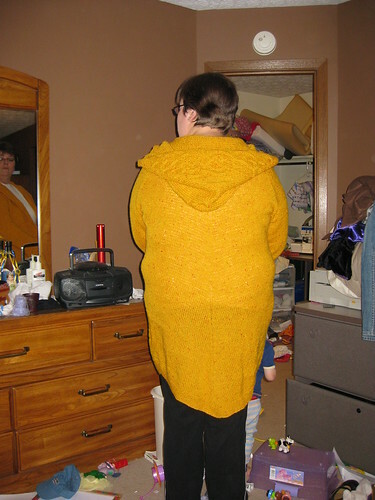 The sweater is long in back – almost to my knees and I am 5’8″. Wow! that is a long sweater and does look like it will make a good light-weight coat. Something Worse Then The “M” Word? « Just Create!